The Festival seeks dynamic creative works from all over the world that are opening up a new era. Please visit the official website for detailed information. A press release (PDF file) can be downloaded from the following address. 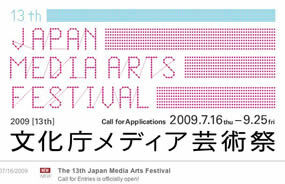 The Japan Media Arts Festival defines “media arts” not only as arts using digital representations and technologies but also as entertainment genres including animation, manga and games; it has been contributing to the improvement of media arts from Japan by recognizing excellence works and by providing an opportunity for artists to present their works since 1997.